While in San Francisco, we had dinner with Mr. Handsome’s distant cousin over the bridge in Sausalito. She lived in a very suburban area and had a small backyard, but she had chickens. 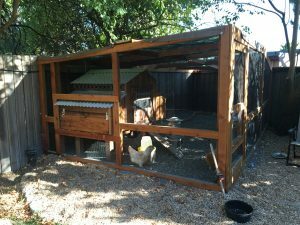 She traveled a fair amount for work and had coyotes in her area, so she installed a coop that would keep the chickens safe while she was gone. Every morning, the door opened to let the chickens roam the fenced yard. And every evening before dark, the gate shut, and the chickens knew just when to go inside. It would shut once and then open back up for a minute (for the stragglers) and then shut again for the night. How clever is that? Mr. Handsome and I would love to have chickens someday, but I’m thinking that a solar powered chicken coop might cost more than we’re wanting to spend. That’s something I would love to have, but you are right. It would probably cost a lot of money. Perhaps you could talk to her and ask how you can make it more affordable. Neat. It might seem like you gave out the location, but life is strange because there could be several houses there with solar powered chicken coups. As unique as that sounds, others could be into living the same way! My sister lives north of that geographic area in Southern B.C. in Canada. They keep chickens at her n her H.’s place, which is a road within a small village. She makes money selling the extra eggs and that pays her expenses. But it is not solar powered as far as I know. Maybe after the technology gets round it will be, her H. is creative! We’re now zoned for chickens, but everyone who has them has unhappy neighbors when the squawking begins at dawn. We’ve also had an amazing increase in the number of hawks circling the neighborhood since chickens moved in. Not only are the hawks going after the chickens, but every other small animal around here, particularly birds and squirrels. I can tell when there’s a hawk around because the crows go nuts, screeching and trying to chase the hawk away. So I’m on the fence about having chickens in the back yard. Yes, fresh eggs, but problems for the neighborhood as well. One of my goals is to rise early. I’m ashamed to admit I roll over and go back to sleep for that deep sleep, staying long in the bed, that fools love ( as I understand the Bible to describe.) So bring on the chickens!!! That would be a great help to wise up and there would be fresh eggs! I really wish I lived in a chicken neighbourhood!